I love Fall fashion but this is also that weird time of year when the weather hasn’t quite made up its mind on which way it’s gonna go. Will it be a true Fall day or Summer coming around one last time? Explains why I was wearing a leather jacket and boots on Friday (weather in the 50’s), and will probably be wearing a lightweight dress tomorrow (it’s supposed to be in the 80’s). Over the span of a day, the weather drops or rises a good 20 degrees or so. So because of that, I’m still mixing warm and cool weather pieces. 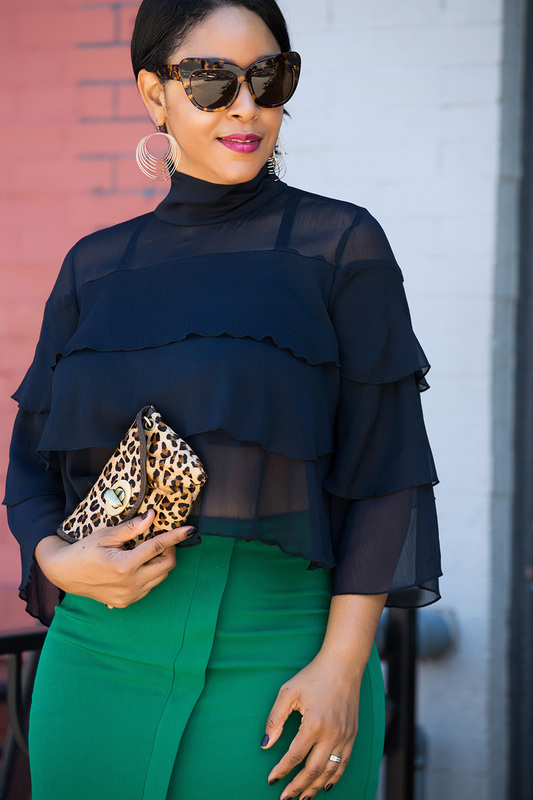 I picked up this bright green skirt over the Summer and even though the color seems more appropriate for warmer weather, paired with this navy blue frilly blouse it instantly transformed into a Fall look. I’ve been drawn to a lot of blue and green color pairings this Fall – you’ll see more in upcoming posts. But back to this look – it’s a fun work look (if you’re looking for some transitional weather outfit inspiration) and it’s the perfect color pairing and material to wear while the weather is still making up its mind. What are you wearing to work during this season of transitional weather?